Time and again I advise entrepreneurs to be mindful of convertible debt. Notes and SAFEs are very popular, but raising multiple notes hides the amount of dilution an entrepreneur is giving up. I find I need to explain this to every entrepreneur I meet. When you get to your equity round, all of those notes need to convert at the size of the initial investment plus interest at either the discount or cap price. Based on the better economics of the two options for investors. Founders need to understand the impact of convertible debt on dilution. At the conversion, common stockholders (founders and employees) can be hit with anywhere from 20–40% dilution at the equity round. This takes founders by surprise because they did not see the progression of dilution from the capital they were raising on convertible notes. We coach founders to try and stay below the 30% dilution mark as this stage as it may be a red flag to Series A investors. Series A investments have a target ownership of 15–20%. 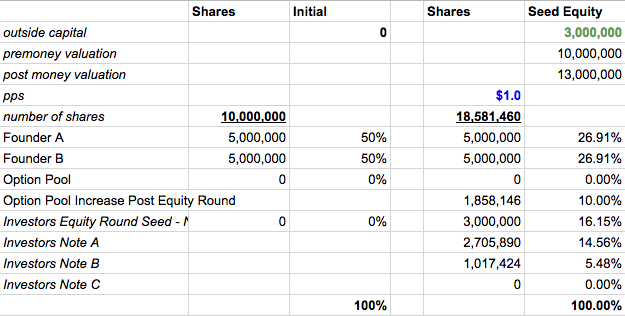 If you give up ownership of more than 30% at seed, then common stockholders are potentially left at less than 50% at the Series A. I never want this for founders. As pre-seed and seed investors, we want you to continue to have appropriate ownership as you raise more capital. We invest so early that your wins are our wins too. We want entrepreneurs to have a strong equity incentive to grow the business over the long haul. Notes have been around for awhile, so what’s the difference now? The difference is the time to get to an equity round or A has been extended and I am seeing a collection of notes for bridges and extensions from founders. If it takes more than a year to raise again, there is almost always more than one note because the founders want a higher cap and the earlier investors want to have a better price at conversion. Everyone wants a write up. When things go sideways at seed, there is a good chance it will mean more dilution when you get to your equity round of funding because either the price of your equity round was not what you expected or you had to take on more cash than planned at lower valuations. This is a problem because many entrepreneurs don’t do the math on the cost of giving up ownership in convertible notes until they convert at Series A. Early dollars are expensive equity dollars and we at Lattice try to challenge founders on prioritizing expenses that grow the business rather than those that have a lateral effect. How can you better see the cost of raising a note before an equity round? Start tracking the impact by adding columns to your cap table with conversion assumptions for later rounds. I put together a back of the napkin style dilution tracking spreadsheet. It prioritizes debt converting prices based on equity round terms. It has a built in option pool that will also show the surprising impact on the founders ownership. Company XYZ is closing an equity round of $3MM on March 31st 2018 on a pre-money valuation of $10MM. CompanyXYZ launched in 2016 and they raised $1MM on a note they opened on November 15th, 2016*. A year later they realized they needed a bridge to get to their equity round. They raised another $500K on a second note on December 15th, 2017*. The equity investors want a 10% option pool as part of the round. Notes will continue to be a way to finance an early business, but raising multiple notes can have a real impact on your ownership. Be mindful about the dilution costs of convertible notes so that you spend early capital wisely. 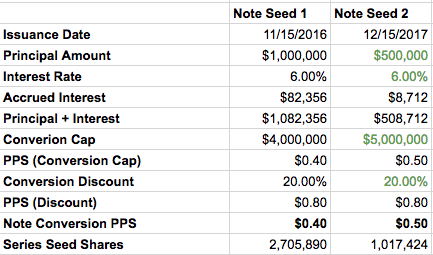 If you have found a public resource that helps calculate dilution on convertible notes, then leave it below in the comments or email me at vanessa@lattice.vc so I can add it to this post. *= This is an oversimplified model of all investors investing in the notes on the dates provided whereas IRL founders tend to accept checks as they come in and get to $1MM, in which the interest for each investment is calculated based on their investment date. **=Please note the cap is increasing from note to note and the equity round is priced higher than the caps of the previous notes. There are other scenarios where there is a down round, where the next round is priced lower than the previous round; or a flat round, where the next round is at the same price as the previous round.